I've gotten to know many new folks during my years attending various VTUG (Virtualization Technology User Group) events. These inclusive events are VMware and Hyper-V friendly affairs, serving up a great combination of free education and fun. I'm super excited to be heading up to the famous VTUG Summer Slam New England next week in Maine, for a day of learning, networking, and food at the free Lobstah Bake afterparty. See also my many related articles, and my interview of the founder himself, Chris Harney! Recently, I've also had the fortune to get to know one of the co-leaders, Chris Williams, who has recently moved to a well-deserved new job at GreenPages Technology Solutions, who also happens to have an immediate need for A LOT of memory in his compact home lab. I'm so glad he thought of me. Chris is an IT guy who gives back so much of his time to the virtualization community. 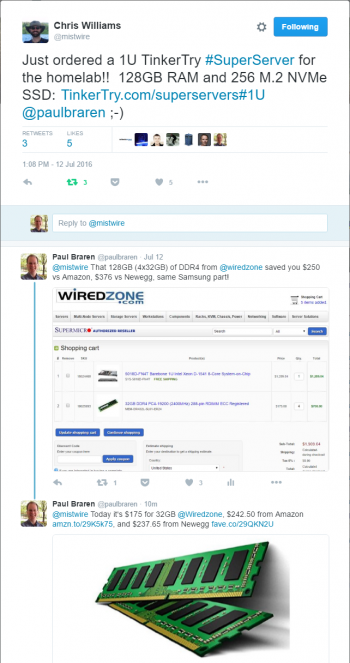 It was an honor to hear Chris state he wanted to show his support for TinkerTry by ordering a turn-key solution from my site that's tested and assembled at Supermicro Authorized Reseller Wiredzone. He even took me up on my offer to record our conversation together, for curious folks. Like many, he's keen on the 1U form factor for his basement quarter-rack needs. I realized that my order page didn't exactly make finding the right links easy. So I fixed that by adding a simple link to the existing order page. In the below video, you'll see me walking Chris Williams through the simple ordering process of adding 4 DIMMs, along with some extras like an ESXi-friendly UPS. I also review the quick-and-easy configuration steps he'll need to perform once his new SuperServer arrives. 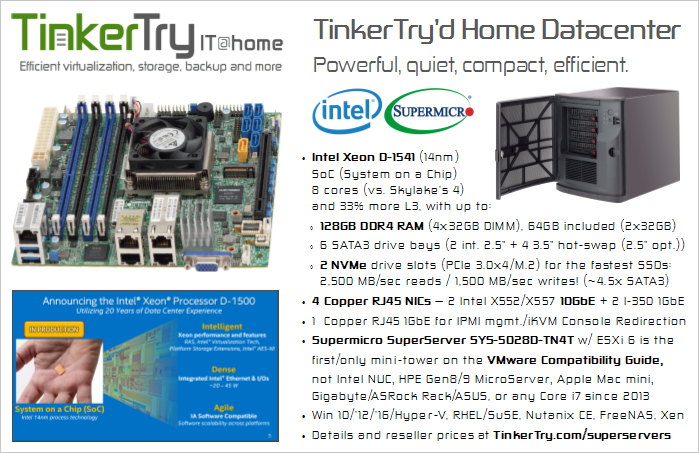 If you happen to be interested in the 1U form factor for the Xeon D-1541 System-on-a-Chip that is finally starting to get the attention it deserves, you'll find all the information you need to become a much more informed shopper right here at TinkerTry. The Netgear ProSAFE XS708T is the first 10Gbase-T switch I would put in a SMB office or a home without reservation. STH has thousands of members experimenting with Intel Xeon D machines that have dual 10Gbase-T NICs. This is the first switch that can be used as a switch to provide high-speed networking to low power server nodes that act as a hyper-convered cluster with storage and virtual machines.